Did you know....Light Levels Decrease with Passing time? It happens so slowly - frequently unnoticable. A sudden lightbulb burn-out usually prompts immediate attention. Until then, well, ... the lightbulb still functions and don't we tend to accept the amount of light it emits. Usually an old bulb doesn't produce very much light at all! ...but... Hey! it's still burning, No sense tossing away a 'good' bulb, Eh? ...Even though they Lose ~60% of their initial light output in the first year!! And worse: they usually wait 10-20 years before expiring. The downfall is that you are still paying for 400W energy, 12 hours/day ... and only getting light output of a 100W lamp or less. Wasteful use of your cash? Mercury Vapour lighting is now banned in many jurisdictions...not because of the waste-aspect, but because of their toxicity. Outside: How bright are the pole lamps, or wall washers or ...and you see this a lot in the country... the single bluish light near the barn, .... you could be spending a lot of money for light that you are not getting! One memorable Project called for Team EELCO to increase light levels at an industrial manufacturer without significantly adding to the power load. The Story: The existing 400 Watt, HPS fixtures failed to provide sufficient light to allow efficient work-flow. Additional fixtures might have been installed except the electrical panel would have required a costly upgrade. Enter TEAM EELCO: After performing the Lighting Audit, Client decided it was vital to increase illumination levels than to focus entirely on Energy savings. The Result: Our Client got both objectives met. The light levels were easily tripled with the installation of T5 fixtures. The number of fixtures increased substantially.....however, the existing electrical panel was left untouched. 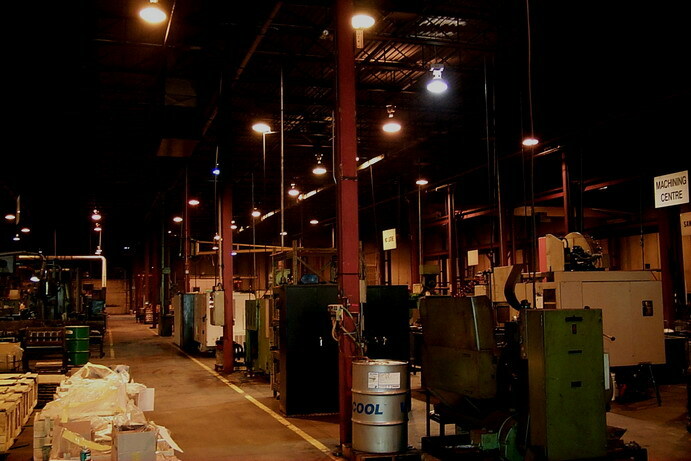 As the T5 lamps have a high lumen/watt ratio, they required much less energy to operate. Is your Enterprise paying high Liability Insurance Premiums in addition to sky-high invoices for electricity monthly? What is your facility's Safety Quotient? You really need to know this. Energy savings and your lower operating costs are our Goal. Creating a safer environment for you is just a Bonus.